My earliest memory of this rocking chair is sitting in it with my sister in the kitchen. We both had one of the many childhood illnesses maybe it was chicken pox, I’m not sure. It’s more of a feeling than an actual proper memory I think. I know I wanted to be near my mum in the busy farm kitchen rather than in bed. We were well enough to be up but not well enough to be running around obviously. We sat in the chair all bundled up gently rocking whilst my Mam got on with the business at hand. I felt comfortable and safe. Thirty years on and the chair is still going strong! But it is in need of a little TLC. It now sits in the sunniest room in my parents house – the porch. It is used to drink a morning coffee or read a Sunday newspaper, or relax and enjoy the view of the garden (and the sun). Which there actually was quite a bit of during my visit in August. 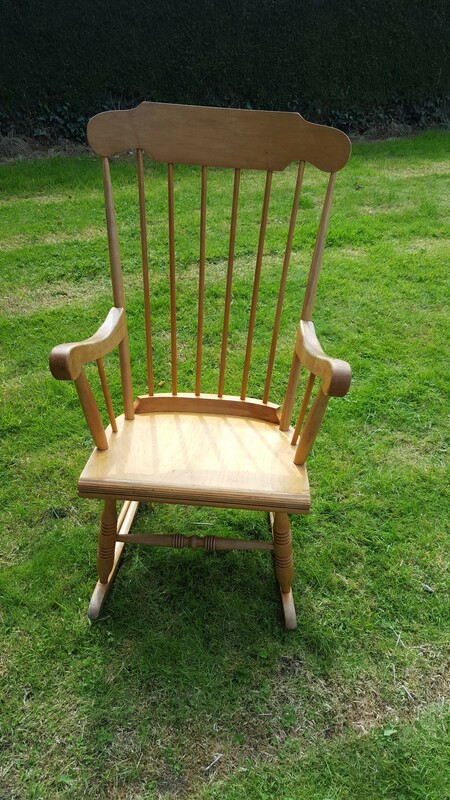 Following on from the living room makeover the porch was my next port of call and the rocking chair is the fun bit! I decided to add a little glass of wine to the 2nd coat proceedings, as the majority of the painting was now being done in the evening after I had finished work and Madam was in bed. 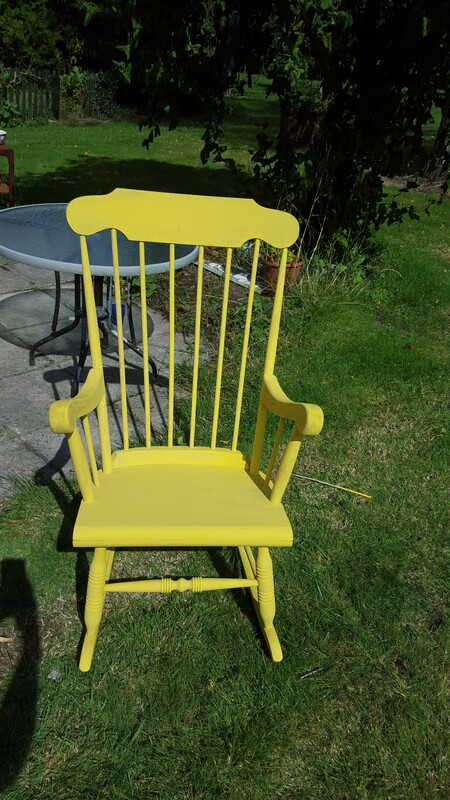 I have had my eye on English Yellow (Annie Sloan chalk paint) for a while now. My husband and I hope to use it for a project at home in the future. The chair needed a good scrub. It has several little annoying crevasses where you just know are going to be tricky to clean. It didn’t take long and I was able to build it into a game my daughter and I were playing. Double whammy. Get some work done while entertaining a 5 year old. A morning well spent. We had set up a fruit and veg shop in my mums garden. We expanded to selling furniture and plant pots. My daughter decided to charge €50 for a banana. And my mum ‘paid’ it! I don’t know if I should be proud of my daughter for selling a banana that must impart the eater with everlasting life at that price, or disappointed with my mother that she would pay that much for a banana. Although she did get a bargain on the carrots…. ANYWAY! Once the cleaning was done the painting could begin. Two coats plus a varnish and Voila! I LOVE this colour. It is bright and beautiful. A perfect colour to reinvent an old friend. There is a piano in my life that might get this colour too. Time and energy is all that is needed! 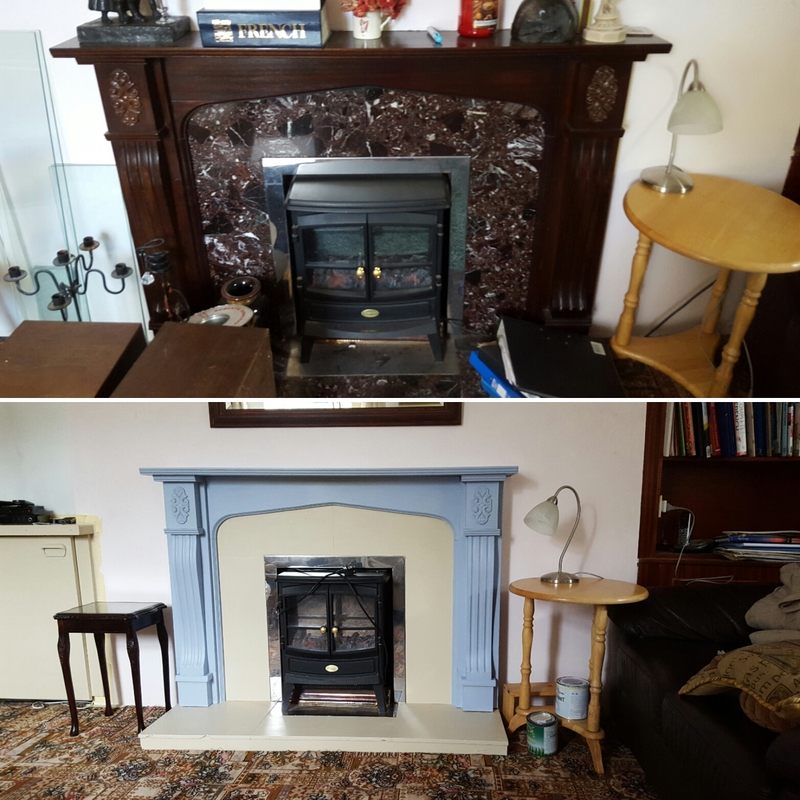 Following on from my first post about my parents living room. I now give you – how to bring the room together! 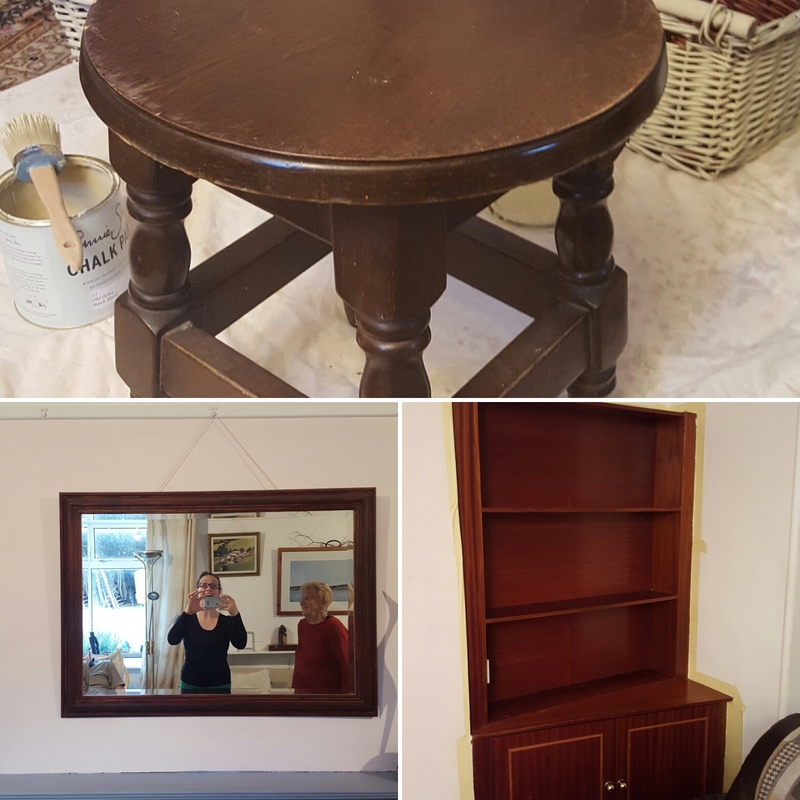 I basically painted the majority of furniture with one colour – Annie Sloan Old Ochre chalk paint. Once the end cabinet was done it was obvious that to bring the room cohesivley together what it needed was more painting! Cue MASSIVE groan. That’s where the snowball began. Thank GOODNESS the paint is so easy to go on. When doing the larger pieces of dark wood furniture I did end up using an undercoat first. As for the end cabinet, I had to do three coats of paint and then one coat of varnish. So that was a LOT of painting, my poor aching arm. (SO worth it though) As long as the surface is clean and dry before you start, you are good to go. And when I say a layer of undercoat it isn’t like a very nicely perfectly painted piece. You are literally just using it to take the harm out of the dark wood so that it doesn’t show up through the paint. A VERY rough coat indeed. It’s still the same number of coats but you get to save a little on being so precise with the chalk paint. Here is a little sample of what I was working with. Mostly dark wood and a fair amount of varnish. Next Stop…. The Porch, which includes, a hat stand, a rocking chair, another chair, a wee table (with a little Calvin & Hobbes decoupage) and a bookshelf. Oh and the DOOR! SO pleased my Mother and Father let me paint their door. My parents have had this dark wooden cabinet ever since I can remember. I think it went in at some stage of the mid 80s. But I’m not sure. Mam has been saying how much she would like to change it. It definitely could do with a little TLC. Before I go any further, a foreword is required. 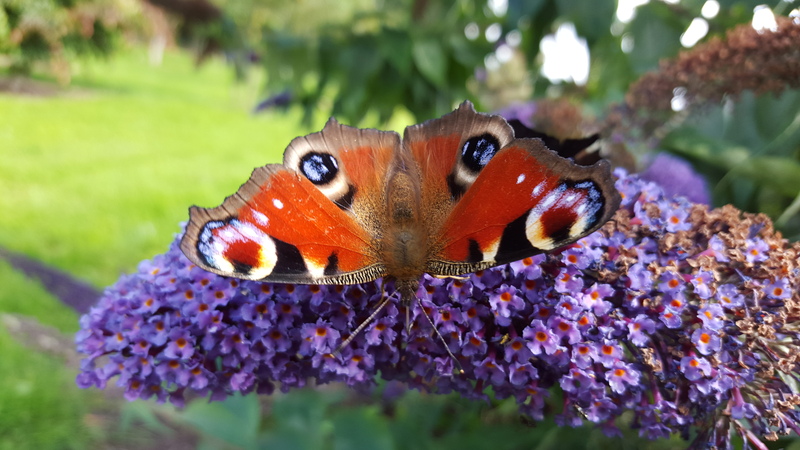 I went home to Ireland for the month of August (which was heavenly) and let me tell you I had no intention of doing anything other than hanging out with my parents and daughter and catching up with as many friends that were around. Somehow I ended up painting 14 pieces of furniture… I still caught up with some friends and got to hang out with my parents and daughter a lot. But talk about the snowball effect! The cabinet was the start of the whole thing. 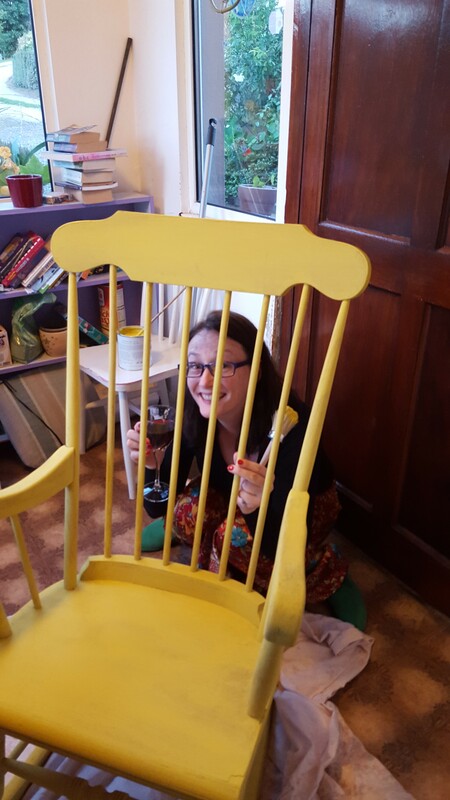 I thought it time to introduce my mother to the delights of chalk paint. After discussing it we decided on a mixture of old white and henrietta. I Googled Annie Sloan Cork. As this paint is only available in the smaller retail outlets. Buy from the smaller suppliers when you can peeps! I was hoping there was a local stockist and ta daaaa! I found ‘The Paint Pot’ (http://thepaintpot.ie/) on St. Patricks Quay in Cork City. I headed on up there and spoke to Jackie who THANKFULLY talked me out of that and INTO Old Ochre. I hadn’t used it before. And boy am I glad I changed the plan. So is my mother! The Henrietta would have been too much pink for that room. 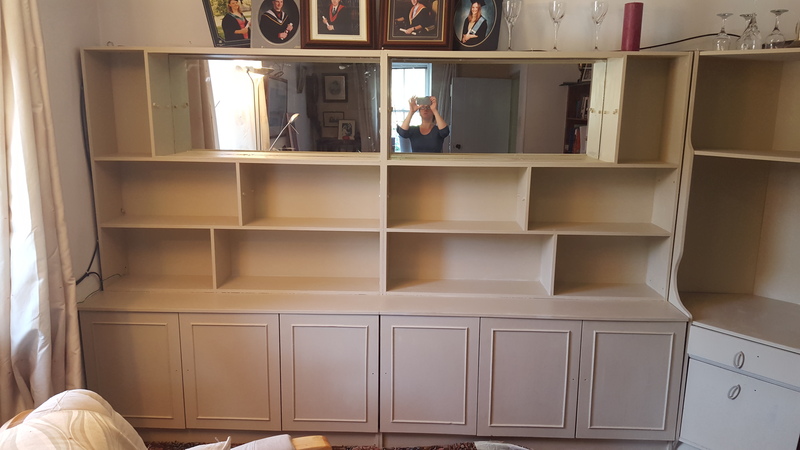 The cabinet was an absolute MONSTER to paint. All those different compartments and corners. And to add insult to injury my little roller broke half way through. But I ploughed on and boy am I happy that I did. Dogged determination. I get that from my Dad I think. That is where the snowball started. 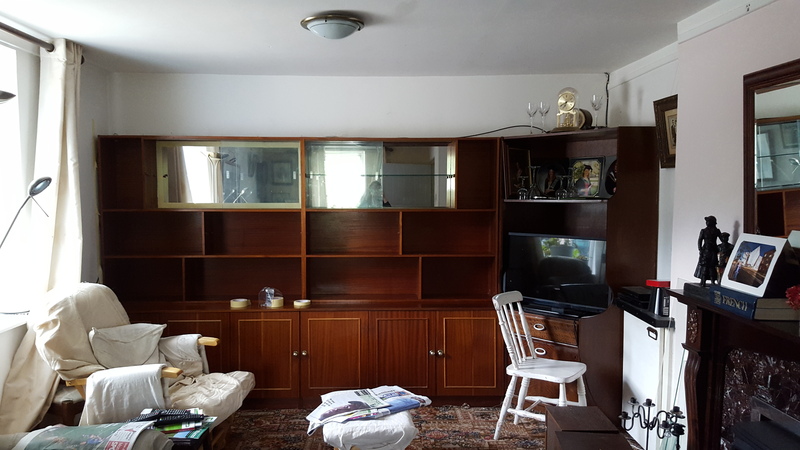 The end cabinet was done and the TV cabinet started shouting at us. I think that is 40 years old and also in dire need of a lick if paint. So that went old ochre. Jackie also had these beautiful handles which with the help of my wonderful father we also changed. The TV cabinet needed a couple of new holes made and a few holes needed to be filled. The end result is a beautiful cohesive unit that actually matches. 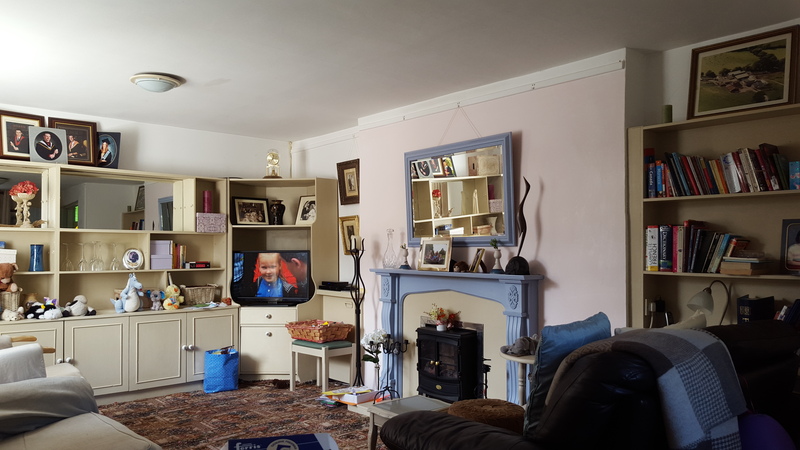 It makes the room feel lighter and more pleasant to sit in and watch The Great British Bake Off. WHAT a difference. It took me the guts of two days. 3 coats plus a coat of varnish. I would normally use wax but thankfully Jackie introduced me to varnish which gives a great finish and is a LOT quicker and easier to apply. 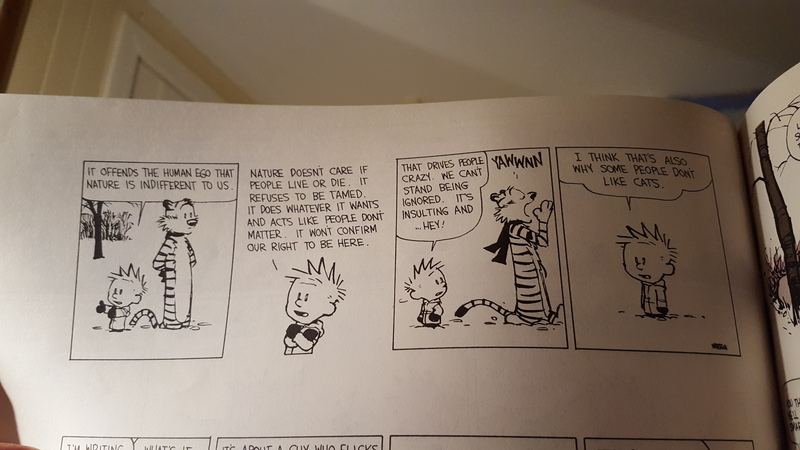 and a giggle with Calvin and Hobbes before I did any more painting.